Art Credits: Shoe logo graphic and cover art for The Kidnapping, Double Fugue, and When The Chips Are Down by Kurt Eberhardt. Hunter & Holmes logo by Hal Peterson. Since it came on the Internet, The ChucksConnection has been examining and documenting the appearance of Chuck Taylor shoes in all kinds of media: films, television shows and series, newspaper stories, magazine articles, and books. One area that we haven't explored in much detail is the area of fictional stories where chucks have a role. That's why we are very excited about a new detective series, the Hunter & Holmes Mysteries, which is about two teenagers living in the Silicon Valley who become amateur detectives to solve crimes that affect them, their friends, and their community. And there is a nice twist to these stories: each detective is an enthusiastic wearer of chucks, and the “chucks club” culture plays a role in the story lines. The first novel in the series, The Kidnapping, tells the story of how and why the Hunter & Holmes detective team was formed. When the series starts, Jason Hunter, 14, and his best friend Daniel Holmes, 15 are carefree teenagers enjoying the start of summer and their extended break from school. Then their lives are radically changed when Jason, while walking through City Park suddenly goes missing and no one can figure out what has happened to him. Jason is a bright, athletic, and well adjusted kid, with no apparent problems in his life so no one seriously believes that he would run away. Unfortunately that means that he was kidnapped or somehow caught up in a crime. His cell phone went strangely quiet, there was no sign of a struggle anywhere in the park, and no one in the surrounding neighborhoods saw anything. If Jason was being kidnapped for ransom, no one really can understand why. He is from an ordinary middle class family, who are comfortable enough due to both parents working full time, but certainly not wealthy like hundreds of others living in the Silicon Valley. The mystery is further compounded by the complete silence from the kidnappers, leading the police and Jason's family and friends to fear that he has been taken by predators with no interest in returning him. As you can imagine, this puts a real chill in the community, and causes Jason's parents to become more and more desperate. Daniel instinctively knows that Jason will never recover from his ordeal until he discovers the who and the why of his kidnapping. Eventually he is able to persuade Jason to check his fears of reliving the horror that he went through and the detective team of Hunter & Holmes was born. But can two amateur detectives succeed in discovering what the police have been unable to find out? 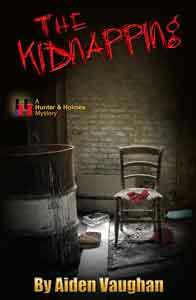 View a comic teaser for The Kidnapping and the Hunter & Holmes Mystery Series. Order the The Kidnapping for your device. 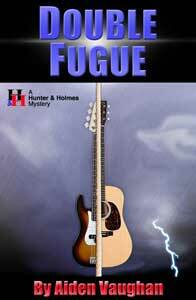 The second novel in the series, Double Fugue is an interesting mix of detective work and music for the Hunter & Holmes team. The first novel in the series, The Kidnapping, focused on Jason a lot while the second novel has more to do with Daniel and his musical interests. The title refers to the two intertwining stories of the book, and the psychological impact that its events have on the two characters (besides Jason and Daniel) that this novel is about. The main story line involves Daniel and his chance meeting with rock star Ethan Savage who is retiring from the music business and planning to give away most of his huge fortune from recording and publishing rights. When Daniel accidentally witnesses Ethan's mysterious disappearance and reappearance, he become involved in a very strange and troubling set of circumstances that end up having a major impact on his life. Daniel also discovers that there are many facets to music as he explores the pop side and learns about the concert/classical side through his interactions with Ethan Savage, Jason's friend Robert Fischer, and local educator and conductor David Molinari. The other story line in Double Fugue begins when Marilyn and Jorge Ferreira, Jason's neighbors from down the block, knock on his door one evening and tell him how worried they are about their young nephew, 14-year-old Eric Acosta, who lives in Springdale, a small Monterey County town 70 miles south of the Silicon Valley. Eric apparently has been attacked and victimized, but refuses to talk about it with anyone, and seems to be withdrawing from communication with any adult, including his very concerned mother. Marilyn thinks that maybe Jason could get through to him, and asks him if he would be willing to try. Based on his own experiences as a crime victim and what he is told by the Ferreiras, Jason immediately senses that Eric has been victimized by a serious predator, and he and Daniel, along with their adult friend and advisor, Mr. Joe Connor, quickly set out to visit Eric and try to get him to reveal what happened. What they discover and become involved in is quite disturbing and gut wrenching! View a comic teaser for Double Fugue. Order Double Fugue for your device. Spring break turns out to be anything but that for Jason and Daniel in the third novel When the Chips Are Down. They agree to help their friend Richard Liu and his father Junjie try and figure out what is going on at his father’s work place, the DCC Chip Company, which has been recently plagued by hijackings of their new line of computer chips. Richard is worried that the company will go out of business and his family will lose everything if something isn’t done to stop the thefts. While looking for a young friend, Jason and Daniel stumble onto what appears to be another hijacking of DCC chips. Convinced that the thefts must be an inside job, Jason and Daniel pose as reporters from their high school newspaper to tour the plant and meet the employees. The boys then travel up to the Yosemite area with their friend and advisor Joe Connor who is remodeling a cabin home he owns near the park. At the urgent and desperate plea of Teresa Barnwell, a young girl living in a foster home, the boys agree to visit a nearby boot camp for teenagers where Timothy Wilkinson, a mutual friend of theirs, has been sent. Teresa is convinced that Tim is being mistreated at the camp. In the past two weeks he has disappeared from the camp roster, all mail to him as been returned, and his parents were told that he has been sent to anger management training. When kids at the camp confirm that Tim and another kid named Cody did not get along with the camp authorities, were constantly being treated harshly, and believe that the two have been taken somewhere to be forced into submission, Jason and Daniel mount an all out campaign to find Tim and Cody before serious harm comes to them. Later they team up with Captain Garcia of the Silicon Valley Police to smoke out the criminals in the DCC case. 49 full color illustrations. View a comic teaser for When The Chips Are Down. Order When The Chips Are Down for your device. Art Credits: Cover Art for Family Matters and Eyewitness News by Kurt Eberhardt. 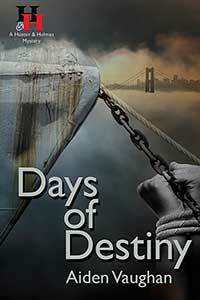 Cover Art for Days of Destiny by Irena Peshina. School is out, but the lazy carefree days of summer are soon filled with more adventures for the Hunter & Holmes detective team. Jason and Daniel have a very unusual meeting with Enrico Feraducci, a Mafia godfather who has a special request for them. Jason and Daniel travel with Joe Connor to southern California to try and broker a reconciliation for him with his estranged daughter and grandchildren. Daniel begins rehearsing with his band as they work on creating their sound and search for a keyboard player. Jason and Daniel then meet and make friends with Nick, a very talented and gifted pianist who wants to join the band but recently has been threatened and attacked by a mysterious stranger who somehow is able to enter his house at will. Jason and Daniel are determined to help Nick and protect him from further attacks. Captain Garcia leads a task force to try and solve a string of missing children cases in the town of San Matthias. Soon Jason and Daniel become involved in the investigation. Jason's relationship with Laura and Daniel's relationship with Diana have major developments. Many of their mutual friends, Eric, Rebecca, Timothy, Teresa, Chauncey and the A List basketball team all have interesting changes in their lives. 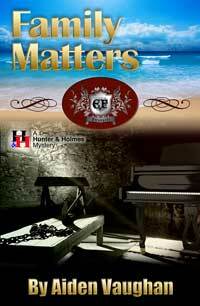 All these things and more are in Family Matters, the fourth book in the Hunter & Holmes Mystery Series. 48 full color illustrations. 302 pages. View a comic teaser for Family Matters. Order Family Matters for your device. After the stunning ending to their adventures in Family Matters, Jason and Daniel are determined to spend the remainder of the summer relaxing and kicking back. Now that Jason and Daniel have pledged to go steady with their girl friends, Laura and Diana, they discover that they have new obligations and personal issues to deal with. Jason is eager to play interleague basketball with his friend Chauncey and his other A-List team members. But new complications beguile Chauncey as another player tries to make him look bad during their games. Daniel is happy to spend much of his time rehearsing with his band now that his rhythm section is settled, Nick has become their neighbor, and is a valued and creative member of the band. After talking with Jason about the recovery process for what happened to them earlier that summer in Family Matters, Nick realizes that he has debt to pay to the other victims who didn’t survive, and begins working on an intensely personal musical project to provide closure. Eric reaches out to help Ben Kessler, the other young boy rescued by Jason and the police task force. On Tim's recommendation the band auditions a potential new member, Jonathan Kowalski, a talented reed player who is an excellent performer on saxophone, flute, and clarinet. Unfortunately Jonathan has complications in his family life because his mother has become addicted to methamphetamines and is spending her time with a low life drug dealer. Jason and the other band members become very concerned about Jonathan as they rally to help him out. Arthur Vincenzo is now living in the Silicon Valley, adopted by Captain Antonio Garcia and his wife, Marisol. Arthur is grateful to finally have a stable home life, but it is threatened by gang members who want to recruit him. Jaime Orlando and the media are keeping an eye on Jason and his activities. Part of the storyline is told from the point of view of reports by Jaime for KHHT television Eyewitness News as the story line builds to its exciting and moving conclusion. Full of action and emotion, you won't want to miss Eyewitness News, the fifth book in the Hunter & Holmes Mystery Series. 294 pages, illustrated with 48 full color illustrations and graphics, and the vocal-piano score to part of Nicolo Ferraducci’s musical project. View a comic teaser for Eyewitness News. 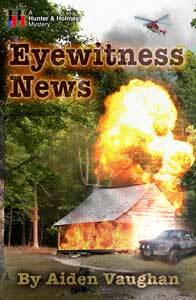 Order Eyewitness News for your device. Days of Destiny begins in San Francisco. Richard Liu, Jason's friend and neighbor, is taking Jason and Daniel up to Chinatown to see the spectacular night time New Year's parade, preceded by a fabulous dinner at a Taiwanese restaurant owned by his Aunt Mai. On the way to see the parade, the three take a shortcut through a building where they discover Jian-heng Chen, an eight-year-old Chinese boy, left locked in a closet by human traffickers who have also enslaved the boy's older sisters. With the assistance of Richard's translation, Jason and Daniel learn how the orphaned boy is bravely seeking a new life in America. Detemined to help Jian-heng out and rescue his sisters, they bring the boy back to the Silicon Valley where he is taken in by the Liu family. But Jason and Daniel have a lot more to deal with besides tracking down the traffickers. Daniel and his band are working on their demo CD, trying to create a complete album of original songs to present to some promoters who have taken an interest in the band since their performance of Nick Feraducci's Requiem for the Lost Children last fall. Jason is very involved with the Merriam High School varsity basketball team which is headed to the district and regional playoffs. Plus Jason's relationship with Laura and Daniel's romance with Diana are taking on new dimensions. To add further complications, the boys investigate a quite upsetting sexting scandal that breaks open at a Merriam High School dance. Eventually the boys are able to focus on Jian-heng's case and the search for his two sisters and the men who have enslaved them is on. What they discover in the process is quite upsetting and shocking as Jason and Daniel use their detective skills to solve this and the other crimes involving school activities. Join Jason, Daniel, and their friends as they face Days of Destiny, the sixth book in the Hunter & Holmes Mystery Series. View a comic teaser for Days of Destiny. Order Days of Destiny for your device. Art Credits: Cover Art for Jason's Network by Steven Wolowitz. Cover Art for Days of Destiny and Troubled Waters by Irena Peshina. It is spring in the Silicon Valley. Jason Hunter is continuing his crusade against predators and those who would abuse children. Through his Whatever Foundation, Jason develops a new tool for kids called Jason’s Network. It is an online resource for kids to help them fight against abuse and predators. It provides a way for kids to report suspected abuse without having to make a formal accusation and to distribute information if a kid goes missing. Jason enlists Daniel and his band, the Second Chance All Stars to help spread the word through a series of school assemblies. The main thing looming in Daniel’s life is the upcoming six city concert tour in June with the Biloxi Brothers. This is the band’s first major break as performers. They are dedicating every spare moment to composing, rehearsing and recording original music that will define the sound of the band. Jason is actively involved with the band as the Webmaster for their band website. He too is looking forward to the band tour. Jason’s relationship with Laura has never been better; they both are quite comfortable with their going steady status. Daniel and Dianna are getting along great also. Her main concern is with all of Daniel’s female fans. The two amateur detectives have nothing currently on their schedules other than schoolwork and the preparation for the band tour. But cases somehow continue to come their way. During a spring break trip to the Sierras with their families, Jason and Daniel end up helping in the search for two kids who go missing. The case ends up having disturbing ramifications that makes Jason even more determined to get his network for kids launched. Meanwhile, an old enemy plans and finances a plot for revenge against Jason. The old adage “No good deed goes unpunished” comes into play for the unsuspecting Jason. He has no idea that his life will suddenly be plunged into turmoil that will create a life crisis for him, his family, and friends. Will Jason’s run of successful cases and interventions to help other teenagers come to a sudden and tragic end? Jason’s Network is Book 7 in the Hunter & Holmes Mystery Series. Don’t miss the excitement and action as Jason and Daniel deal with one of their biggest crises yet as detectives and as they experience the world of large scale concert performances for the first time. View a comic teaser for Jason's Network. Order Jason's Network for your device. It’s July. Beautiful summer weather and time off from school should mean a relaxed vacation for Jason Hunter. Instead he finds his future filled with uncertainty. Jason has been told by nearly everyone he knows, including Daniel, his best friend and detective partner, that he needs to take time off from any detective work after the brutal attack he and his steady girlfriend Laura experienced a few months earlier. Jason has recovered physically from his injuries, but finds himself completely isolated from Laura. Laura’s parents have taken her on an extended European vacation. As a result Laura completely missed Daniel’s six-city band tour in June. The only communication from her Jason has received in that entire time was a letter and a postcard with no return address. Jason is beginning to have serious doubts that they are still a couple. Jason’s friend Cody has taken it upon himself to help Jason out. He has invited Jason to spend the month of July with him in Malibu. Part of his therapy for Jason is to get Jason away from his Silicon Valley scene and teach him how to surf. Cody is a good teacher and his plan for Jason begins to work. Then a second letter arrives from Laura casually mentioning some of the boys she has met in Europe. Jason decides that maybe he should start meeting other girls, but is still conflicted inside. One day while touring in nearby Oxnard, Cody and Jason discover that a local beach has been closed due to toxic pollution discovered in the water and meet a fellow surfer burned by the pollution. Infuriated, Cody joins a local stream team to monitor the nearby Calleguas Creek, the source of the pollution, and to help search for the polluters. Soon he talks Jason into acting as an armchair detective to help him figure out how the polluting was accomplished. Back in the Silicon Valley, Daniel and his band have taken some well deserved time off after their tour, but soon are wanting to get back into the studio to create new tracks for their second CD. Although the band is unified in the direction that they want to take, their record company has other ideas about what they should be doing. Their summer is further complicated when a large amount of their band equipment is stolen after a performance at a private party. Without Jason around, Daniel must take the lead in trying to discover who was responsible for the theft. At the end of July, Daniel, Eric, and Diana drive down to Malibu to visit Jason and Cody, but when they arrive, they discover that both of their friends have gone missing that morning! Now the pressure is on Daniel to figure out what happened to Jason and Cody before it is too late. 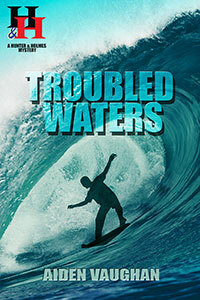 Troubled Waters is the eighth book in the Hunter & Holmes mystery series. The lazy days of summer suddenly turn into an action filled adventure for Jason, Daniel, and Cody. View a comic teaser for Troubled Waters. Order Troubled Waters for your device. Senior Year Part 1 is the ninth novel in the Hunter & Holmes Mystery Series. 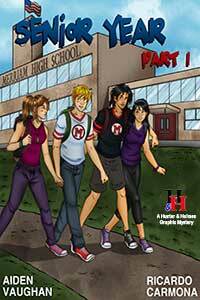 The Senior Year mysteries are being released as full color graphic novels. In part 1, Jason Hunter and Daniel Holmes have just begun the first semester of their senior years at Merriam High School in the Silicon Valley. They are both looking forward toward enjoying this important time in their lives with their steady girl friends Laura Friesen and Diana Miglione. Additionally Jason is a member of the school’s basketball team who will be defending their northern California championship, while Daniel and the other members of his band, Eric, Tim, Nick, and Jonathan are working on their second CD and developing a relationship with Rowan Holt of the BMA Entertainment Agency. The last thing they needed was a new mystery to work on, but when Anthony Briseño, one of the trumpet players in the school jazz band goes missing, Daniel and Jason feel compelled to act. Did Anthony run away from home or were there more sinister reasons behind his disappearance? Captain Garcia and the Silicon Valley Police quickly step in to investigate and later the FBI becomes involved. Jason, Daniel, and the authorities soon discover that family ties are an important factor in what happened to Anthony. Later, a second case comes up during a cheating scandal at school, when fingers are pointed at several of the basketball players. Jason acts to preserve the honor of his teammates and ferret out the cheaters. A third challenge comes from the appearance of a small boy, Eloy Sanchez, found alone at a fast food restaurant. Eloy’s family has apparently been victimized by human traffickers, forced to work long hours in a sweatshop packaging cosmetics. Eloy stowed away in their delivery truck to get help for his parents, but doesn’t speak English and doesn’t know where he and his parents have been staying. Two Merriam High School girls notice Eloy and contact Jason’s Network. After Jason is notified about Eloy, he brings along Mariano Rodrigo, Jason’s basketball teammate to translate and enlist his family to watch over Eloy. Word of their intervention with Eloy quickly spreads around campus. Now Jason and Daniel must get to work, with everyone expecting them to solve the case, bring down the traffickers, and reunite Eloy with his parents. Then Jason, Daniel, and their friends can get back to enjoying their Senior Year. View a preview of Senior Year Part 1 on the Hunter & Holmes website. Order Senior Year Part 1 for your device. 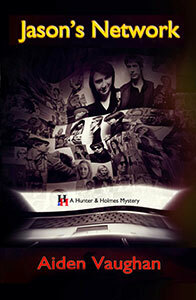 Return to the Hunter & Holmes Mystery Series main page. 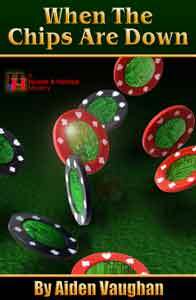 If you would like more information about the Hunter and Holmes Mysteries go to their website at hunterandholmes.com.